Your donation makes future programs and events possible!! Receipt for your donation will be sent by email. We also happy to receive your donation by check. Our mail address is below. Receipt for your donation will be sent by USPS. Please specify your home address. 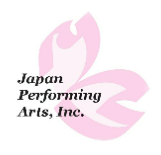 Japan Performing Arts, Inc.is a 501(c)(3) tax exempt, not-for-profit organization.